When I was in high school my parents weren’t familiar with CLEP exams or how these exams would have helped me gain college credits while in high school. I know if they would have known, they would have had me take advantage of the CLEP exams and it would have saved them so much money. It wasn’t until college that I learned about CLEP exams. I decided to take a Language CLEP exam and boy was I SO glad that I did! It saved my parents’ hundreds of dollars and I was able to knock out three college courses just by taking one CLEP exam. Of course I had to get a passing grade on the exam. I was over the moon excited about that!! Not only did I pass the Language CLEP exam, but I did excellent on the exam, which earned me 4 extra credits that I was able to apply to meet an elective requirement. I also saved myself time by not taking courses that I already mastered. Paying tuition dollars to obtain college credits for subjects you already know is a waste of time and money. So, taking even one CLEP exam was totally worth it! In case you aren’t familiar with what a CLEP exam is, let me explain. 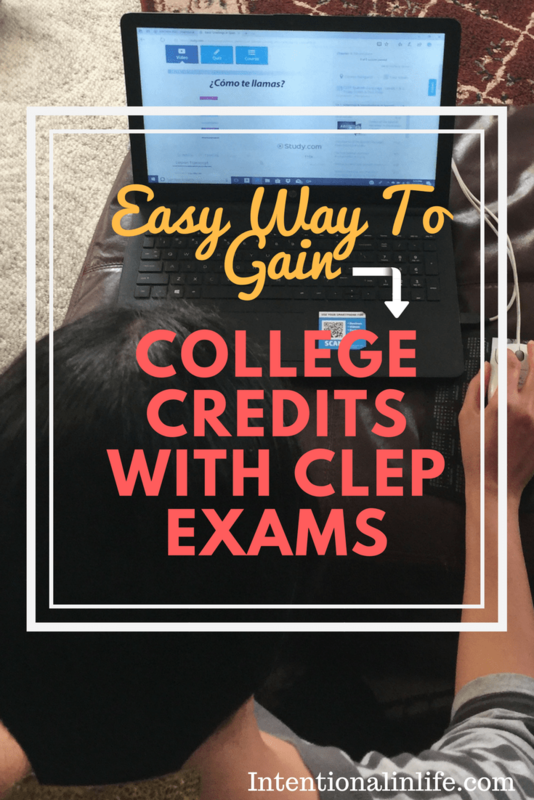 CLEP stands for the College Level Examination Program, which offers over 30+ exams that can help you earn college credits for both the fraction of the cost and time compared to colleges and universities. CLEP exams are what you call Prior-Learning Assessments, which means that they test your knowledge in a particular subject to measure your level of understanding. Passing a CLEP exam is like taking a course at your college, except you prove your mastery in the subject leading you to gain college credits for that particular course without the need to take the class. Isn’t that great! Now that I’m a parent and have children of my own, I want to be intentional in providing them with the resources that manage their time. If any of my boys decide to go to college I will definitely encourage them to take at least one CLEP exam. Knowing this already, I’ve been on the lookout for resources that can help me better prepare my boys when they get into their high school years. In searching for resources, I was ecstatic to discover Study.com. I found it to be such a valuable resource for parents of high school students that are looking for an easy and cost-effective way of earning college credits. It would have been nice if I had something like the CLEP test prep product when I was studying for my CLEP exam many years ago. 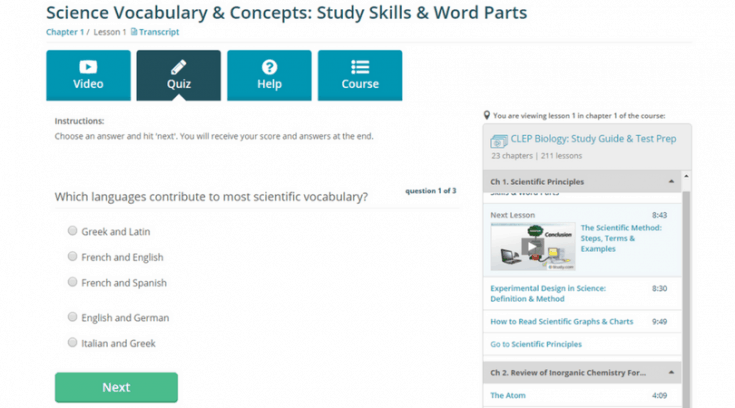 I would have definitely enjoyed studying for my CLEP exam using Study.com’s CLEP test prep product, more than studying from a boring study guide manual. As soon as I had access to the site I jumped right in! I decided to take a look at the CLEP Spanish Language- Levels 1 & 2 because that was the CLEP exam I took years ago. I was curious to see how it was set up and wanted to go through the study guide course and get a feel for how they were teaching the different lessons. Let me just say, this product is pretty awesome!! I was totally impressed! This is definitely a resource that I will want to use when my oldest is ready. 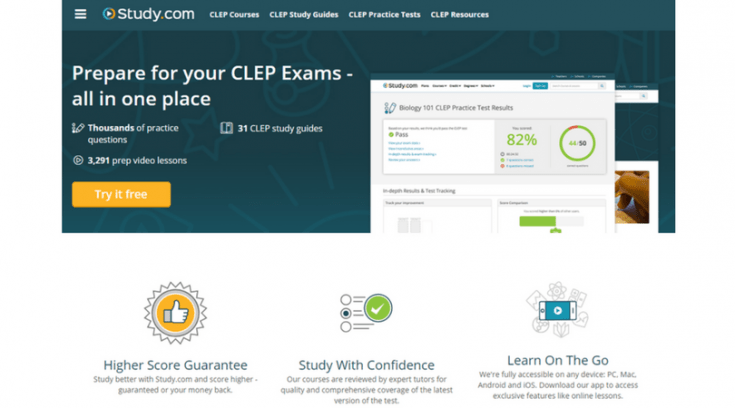 Let me share with you 5 awesome features that the CLEP test prep product consists of. The videos on Study.com are short (yay! ), easy to follow and teaches you exactly what you need to learn. The videos are animated and help you grasp the concept of the material in a manner that is easy to understand. The materials that are covered in the videos are aligned with what will be covered in the CLEP exam. This is a great perk! 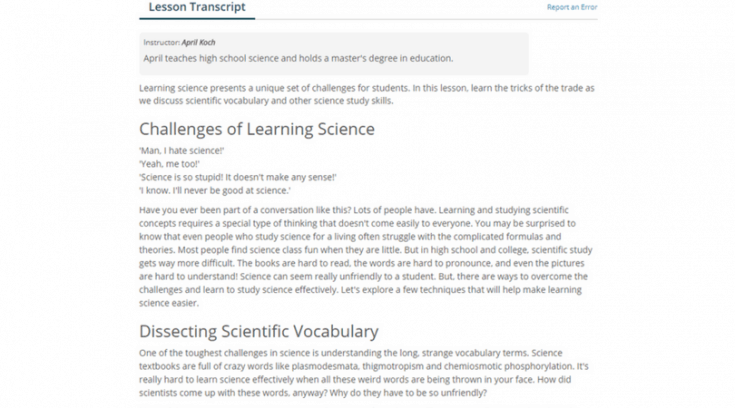 The text transcripts go along perfectly with the teaching videos. After, watching the video lesson you can go back and read the text transcripts to go over the materials that you just learned. You can use them as a reference and take your own notes or print them out and use them as notes. I love this feature because the work its already done for you. So, you are able to focus and concentrate on the video lesson without the added stress of trying to write notes while watching the video. There is a quiz that goes along with each video lesson that you watch. This is to help you remember the materials that were covered by the video. It’s another form of helping you apply what you just learned, which helps you retain the information better. What is great about the quizzes is that if you get an answer wrong it will tell you immediately and it will refer you back to exactly the part of the video that covers that exact concept. So, you can go over the materials that you need to focus more on. This alone is such a time saver!! I really like how they have practice tests that you can take after every chapter. 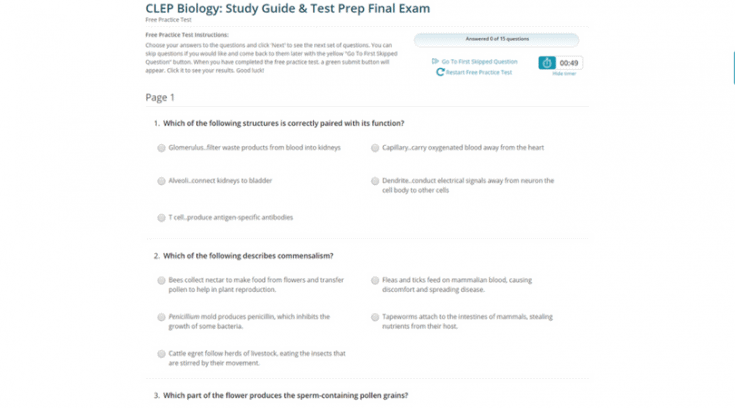 They provide these practice tests so that you can get used to the testing format before taking the actual exam. After you take the practice tests you get immediate feedback on how you did. It will show you how many you got right and wrong. The questions that you answered incorrectly will have a link to click on that will take you back to the part of the video that will go over the materials that you missed. The practice test helps you focus on the areas that you need improvement in and helps strengthen those weak areas that you may have in that particular subject. This is so helpful for any student studying to take a CLEP exam. 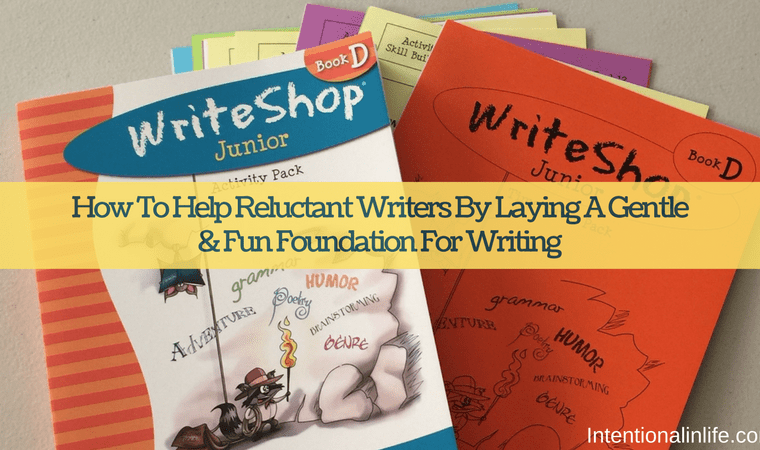 It helps them stay focused and encourages them to continue to move forward in their studies. This is one of my favorite features! After you decide which CLEP exam you want to study and click the ‘start this course’ button, a small pop up comes up where you can pick the date that your CLEP exam is scheduled for, this will help Study.com create a personalized study plan for you to help you stay on track. How great is that?!? As a mom, I LOVE that!! This will definitely help the student to learn how to manage their time wisely so they can learn all the materials before they need to take the actual exam. It will literally save you hundreds of dollars. Your child can start gaining college credits while they are in still in high school. It will save your child from attending college courses that they already have knowledge about which will help them finish their degree in less time. Your child is able to set the pace, with your guidance, that best suits them when studying for their CLEP exam. The materials are taught in many different ways that cater to all types of learners. Both the quizzes and the practice tests help your child become familiar with how the actual exam is set up, which will help them feel more confident when taking the actual exam. Study.com set’s up a personalized study plan that will help maximize your time and score. The website Study.com is easy to navigate and its set up is fantastic! Your child will be able to log in and complete the study course on their own. You get email notifications to track your child’s progress which is great! There are 30+ exams that you can take to get college credit for. It will definitely teach your child what they need to know so they can do great on the actual test. You are able to do it from the comfort of your own home. I know that when you try it out for yourself you will see what a wonderful resource it really is. I had a wonderful experience using this product and I believe if you were to give it a try, you will too. 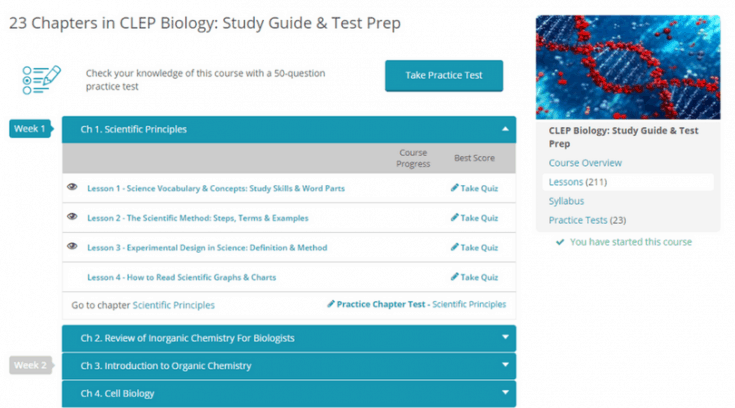 Want to experience the Study.com’s CLEP test prep product? I encourage you to sign up and give the FREE TRIAL a try and see what all my raving is about! You can also check out their CLEP resources page, CLEP practice tests, and CLEP courses which are very informative and very helpful. 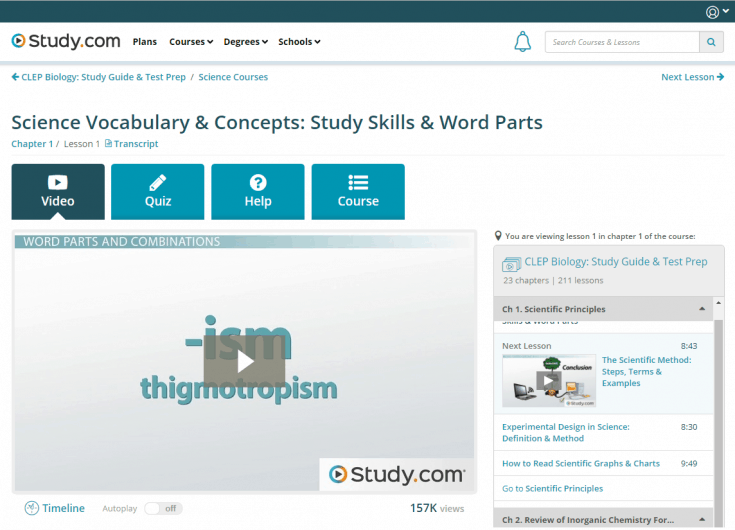 If this is something you want to pursue make sure to get 20% off your first 3 months of Study.com’s CLEP test prep product with coupon code HOMESCHOOLFORCLEP. It’s valid through May 31, 2018, for new members only. HOW TO REDEEM: Click the “Have a Coupon Code?” link on the last page of the registration process, input the coupon code HOMESCHOOLFORCLEP and click the “Apply Coupon” button. There is also an opportunity for three students to win a Study.com CLEP scholarship. Applicants must be a citizen or permanent resident of the United States of America. Applicants must be planning on taking a CLEP exam by April 1st, 2019. Applications must be received by April 1, 2018. What is one way you plan on saving for college tuition? CLEP is on my favorite list! We have to research more then try CLEP exams. I hope we will succeed in the end. 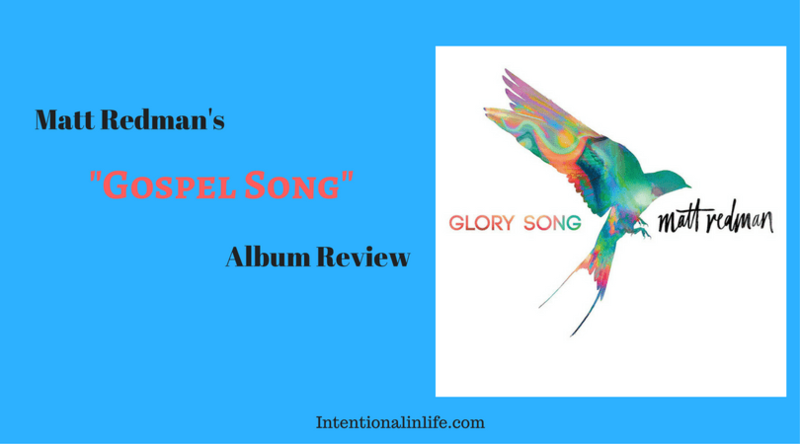 Thanks, Jessi for your brilliant write-up! I love CLEP!! Such an easy way to save seriously so much money! Another tool that I found is StraighterLine. It’s actually a class, but it’s even less expensive than CLEP if you take multiple courses. If your school accepts those transfer credits, it will literally save you THOUSANDS of dollars! Yes, I also love CLEP! 🙂 Gabriella I have never heard of StraighterLine before but it sounds like another great option. Thank you so much for sharing that resource with me, I will definitely be checking it out! Thanks for stopping! I was just talking to a coworker about how I seriously regret my degree choice and really wish that I could take some additional courses in a different field without actually having to go back to school. I have never heard about these courses but I’m really interested in seriously looking into them. CLEPing can definitely help but do make sure that the college or university you want to go to accept CLEP college credits. Unfortunately, some colleges and universities don’t accept them anymore. If you go to Study.com there is a section that you can type in the college/university you are interested in and it will tell you if they accept the CLEP college credits or not. I wish you the very best and hope that it will all work out for you Carly. 🙂 Thanks for stopping by and taking the time to share with me. College is so ridiculously expensive. Every little bit counts! Just make sure your college will accept the credits. It’s unfortunate that some won’t anymore. Yes, tell me about it! It is sad that some colleges and universities won’t accept CLEP exams anymore. I’m encouraged to know that there are still many that will. Its important that we do our research before taking any CLEP exams to make sure you meet the requirements for the college/university you will be going too. Thanks for stopping by and sharing that important tip Hil!